Discussion in 'Mobile Free Browsing Codes And Tips' started by ifeskilz, Dec 3, 2016. Xclusivetek had not been fully able to welcome all its viewers to the month of December and wish you guys happy new month. Thanks to the senate, the data bundle increment has been suspended but Xclusivetek still will give you latest free browsing and cheap data bundle so you won't complain of low data plans and stay updated in your social networks, music, films and lots more. and save it as default. Put the download link the box provided. That's it, your download will start. Reality VPN allows you to use premium tweakware servers for free but its capped 250mb daily. To bypass this limit, you need to root your smartphone and change your DNS with DNS changer when you reach the daily limit so it would reset thedaily limit. Glo with Tweakware VPN still remains the best because it's unlimited and can be used with all apps. To enjoy it unlimited, you must be a premium user. Now, click save and it'll connect within 5 seconds. The cheat is currently blazing and stable so feel the speed and enjoy! This one is new and it was customized by Successtechz. 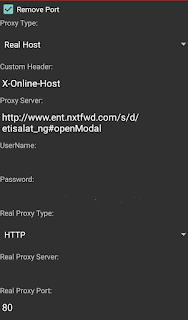 It involves using XP Psiphon to browse with Glo or Etislat. Airtel has not really been my favourite network but there are some cheap free browsing you can enjoy. Airtel introduced a double double data ofeers which helps multiply your data bundle twice. The validity period is 30 days. It's unfortunate that not all Airtel SIMs will be able to benefit from this Airtel double data offer. You can also use Airtel BIS on your Android If you are not eligble for this offer. MTN still remains one of the most usednetwork in Nigeria. Since the fall of BBlite, ther having been too much free browsing to enjoy using MTN. But there is a working 100% data bunlde that is working but is only enjoyed by some users. Tweak it like three times using several imeis generated using IMEI ANALyzer. Once you tweak one imei, put successfully, put your phone in airplane mode for like 3 minutes and off the airplane mode and tweak it again. Once you have done it like three or four times with different imeis, switch off your phone and put your sim card in a nokia touch. Now subscribe for 1GB for #500 and it would be multiplied to 2GB, subscribe for 1GB for 1.5GB and it would be doubled to 3GB. You have to subscribe using a nokia touch for the first time only. After that you can use your Android phone and subscribe and still enjoy the offer. Offer last for six months so utilize it well. Xclusivetek has done justice to all networks for question about a specific network free browsing or cheap data subscription, feel free to ask using the comment box. If it worked for you don't hesitate to thank us using the comment box.